The working class neighborhood of Paterson, New Jersey just northwest of the Great Falls is the best place to stroll around and get a sense of what inspired the recent film by Jim Jarmusch named for the city. 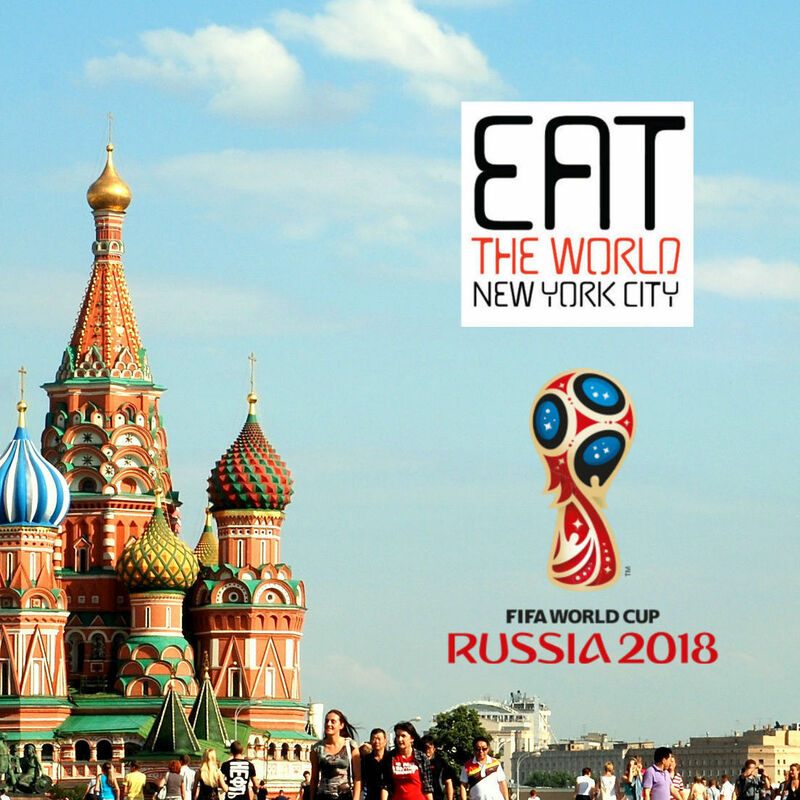 While the bustling downtown and more Middle Eastern neighborhood south of I-80 see more outsiders, it is this area that truly represents Paterson old and new, giving a sense of what has been but also sticking to its nature of being an incredibly diverse place. Peruvian and Bangladeshi share the street with small Dominican, Chinese, and pizza spots that look like old standbys. If you came to Paterson to read William Carlos Williams' famous epic poem of the same name, of course read a little bit near the Great Falls, but enjoy most of it here on Union Avenue and up the Passaic River following the light and heavy industry that the falls have always powered. A spot at the bar of El Sabor de Mi Barrio might also be a good place, at one of Union Avenue's most popular Peruvian restaurants. As with a lot of places in New Jersey, this establishment has had a nightmare with the state's liquor laws and does not have alcohol, but it is comfortable and open early for breakfast. 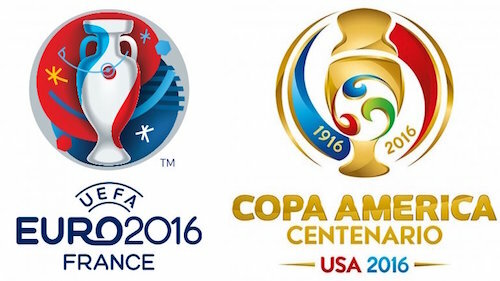 Three TVs make me think that Peru's first time in the World Cup since the 80's coming up this summer will be thoroughly enjoyed here. The menu here is overwhelming to say the least, meat and fish options both feature full pages in small type. Entrees are in the $12-15 range, but gigantic and at least two meals apiece. This makes sharing a little more difficult, but order a bunch and expect leftovers. Everyone in our lunch group of three each had a takeaway meal ready for dinner. 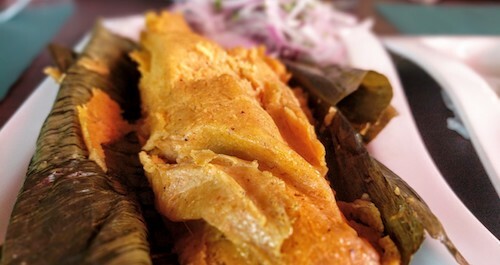 To start things out, we ordered one Peruvian tamal ($5, below), a large yellow corn creation wrapped and steamed in a banana leaf. Also available in chicken, this order was pork, juicy pieces of the meat that must have tenderized for hours. 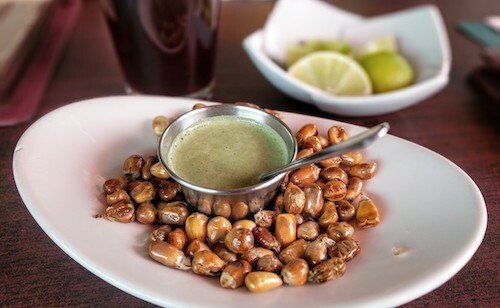 I usually cannot eat a Peruvian meal without something smothered in huancaina sauce, the creamy sauce made from cheese, milk, and aji amarillo, the ubiquitous yellow peppers of Peruvian cuisine. 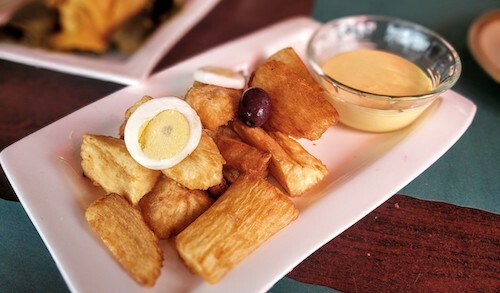 Instead of potatoes, we chose yuca a la huancaina ($7, below), fried sticks kept separate from sauce. Dipping or dousing is up to the customer. If anything on the table could have been chosen at a bit of a disappointment, it was unfortunately this dish. 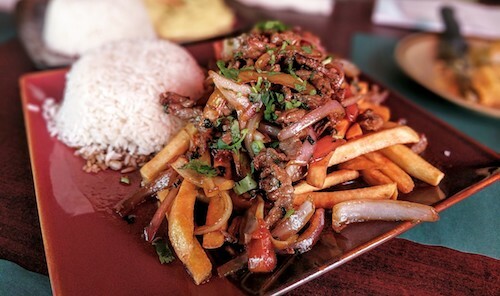 Despite its name, the lomo saltado ($14, below) is free from extreme saltiness and relies on all of its other ingredients to create a complex savoriness. The stir-fried pieces of beef, onions, and tomatoes are thrown over a bed of fries and served with rice. 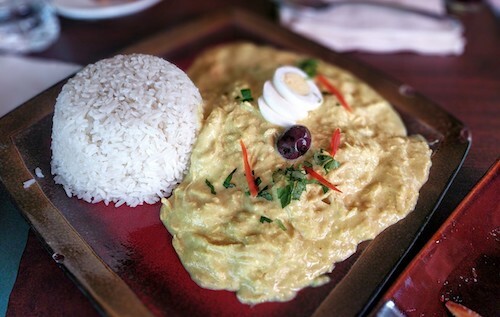 We had another chance to try aji amarillo in the very nice aji de gallina ($13, below). This kind of pepper has been used in cooking in this region since ancient times, and adds the bulk of the heat for any Peruvian cuisine nowadays. This particular dish was only slightly spicy, but again had layers of subtle flavors. The standout of the meal was the massive plate called El Clásico ($22, below), a combination of a jalea and ceviche. 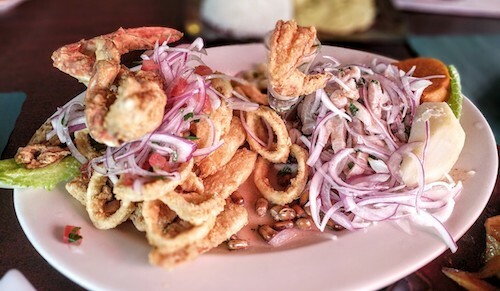 Jalea is a type of typical Peruvian drinking food made up of many types of fried seafoods. This plate had thick cuts of white fish, calamari, shrimp, and crab. We asked for the ceviche spicy, and it came through slightly in this regard, but thoroughly in that it was delicious. One of the best to be found in the area, the combination plate was massively satisfying. For future reference, you can bring in your own beers. Paired with this beauty and a World Cup match, life would not get much better.